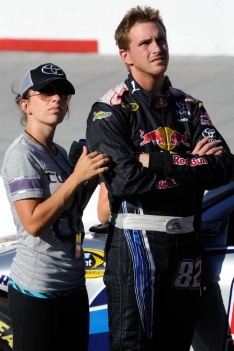 He was apart of Red Bull Racing last season and drove the #82 toyota. Brian Vickers had blood clots and had to end his season early so it was Scott who raced. Kasey Kahne was to join the team for the 2011 racing season and then move on to Hendricks. Scott was told by RBR that he would no longer be working for them in 2011. He had been terminated. Scott also sued RBR for 6.5 million dollars.........he was out of a racing career for many months when the termination happened...Also another event happened after Scott was notified of his termination.. the tweet below expresses what happened. scottspeed "On 11/24. As it happened RedBull sent me a Termination Letter, not huge surprise, and @mamaspeed41 was diagnosed w/ Lung Cancer, BIG surprise"
Amanda_Speed "Well I guess @scottspeed put the word out... Yes, I am pregnant!!!! We r very excited!!!!!" This news was exciting for all fans and for the Speeds. We all could see the light breaking through and knew that it was going to get better for Scott and his family. He had a NNS ride with KHI in late august so we could only wait for that. Then he got the chance to race in the Indy 500... but his car wrecked and was unable too. One day though more bad news came out and i was notified of some of this news and i saw a tweet from Scott.....his mom had passed away from lung cancer. 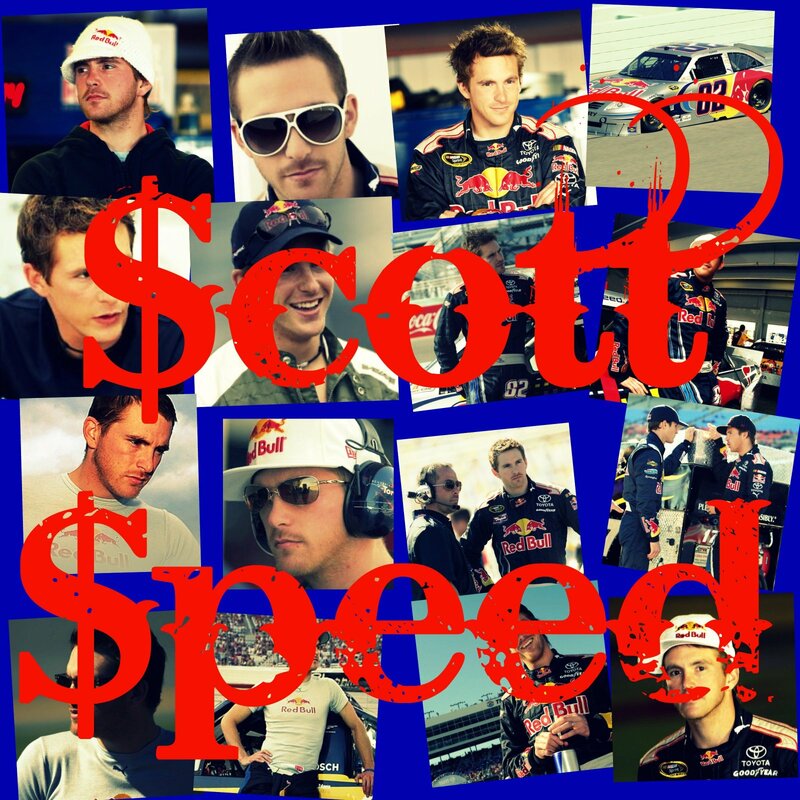 scottspeed "Hardest night of my life. I love my family more than anything in the world." Honestly I was majorly bummed out for Scott and his family. Even with a baby on the way... they still were looking for NASCAR chances. then this past monday we got the most exciting news ever... here is the article from Scott's website. 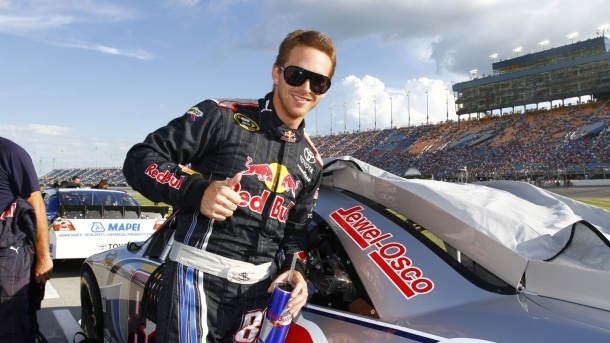 CHARLOTTE, NC (June 25, 2011) – Max Q Motorsports has signed Scott Speed to drive the No. 37 Ford Fusion. The team will start running Speed this weekend in Indianapolis, at the 18th annual Brickyard 400. The 28-year-old former Formula One driver Scott Speed, who drove for Red Bull Racing in the NASCAR Sprint Cup Series the last two years, will make his first start since 2010. Speed has 76 NASCAR Sprint Cup Series starts, with one top-five and three top-10s, eight top-10s in 13 starts in the NASCAR Nationwide Series, and one win, four top-fives and nine top-10s in 16 starts in the NASCAR Camping World Truck Series. The team will be running Speed in a Ford Fusion with the FR9 Roush Yates engines. The duo plans to run at the next three races – Indy, Pocono and Watkins Glen with hopes of continuing the rest of the 2011 season pending sponsorship. The No. 37 car sits 39th in the NASCAR Sprint Cup Series Owner points, so Speed will have to qualify on time this weekend at Indy. Amanda_Speed "We r in!!!!!!!!!!!!!!!!!! Thank you Lord!!!!!!!!!!! 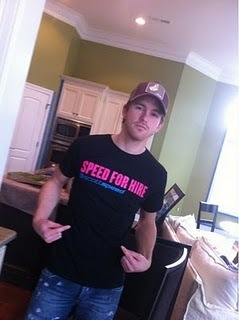 Way to go @scottspeed!!!!!!!!!! And the 37 guys!!!!!!!!!!!!!!!!" Thanks to all who read these articles... it means a lot! :D Also all the links for the article... how to tweet amanda and scott and picture credit will be posted at the end! NO COPYRIGHT INTENDED! :D Also this is a personal blog so this is my view on all this! :D thanks again for reading!